I've been running 5Ks since I was 14. Sure, it was only one a year up until I turned 20, when running became fun and not swim team dryland torture. After running my first 3.1-miler ever, the distance got easier as I ran longer and trained harder. But at the turkey trot I ran this year, you may as well have turned the clocks back to 1994 and put me right back on the course of my first Birmingham Lions Club Run for the Blind 5K. Yes, that's how tough it was--and it was only a 5K (which I'll get to explaining). When I learned that the Chicago turkey trot I ran last year had been shortened from an 8K to a 5K, I scoffed, knowing I'd barely burn off my holiday dessert at that distance. 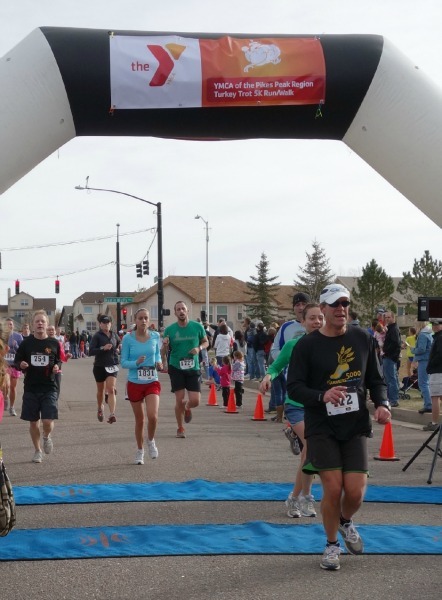 When I knew I'd be running a 5K in Colorado Springs where the elevation is roughly 6,800 feet above sea level, I was thankful that the city's largest, and only, turkey trot wasn't any longer. A 5K at altitude is an entirely different animal. When you run a 5K at altitude--and you're not even close to adjusted to the added elevation--it hurts. A lot. Every step of it. You can't wait to cross the finish line because it means you can stop running and the burning sensation in your lungs can finally subside. That lingering idea of a 5K not being far enough to run on Thanksgiving Day to make up for the food frenzy? The thought of doing a second workout to put more calories burned in the bank sounds preposterous. And the workout itself? Abandoned. I thought that last year's Strike Out ALS 5K was tough. I had just gotten the OK to try running again after recovering from a stress fracture, and instead of testing my legs on the trail and quitting when they hurt, I registered for the 5K. I ran the first two miles--nowhere near the 5K speeds I usually could keep--and then walk/shuffled (I can't really call what I was doing at that point a run) the remaining 1.1 miles. But that race has nothing on the YMCA of the Pikes Peak Region Turkey Trot. Make that running the Turkey Trot. The YMCA did a great job with the race's organization. Registration was a little tricky (I had to create a second account after screwing up the first one), but aside from that, no complaints. By Chicago standards, the $23 sign-up fee felt like a bargain (so much so that we heeded the Y's advice and donated some extra cash to help the community). It was easy to pick up our packets--nice volunteers, no lines, and several pick-up days. It was easy to park race morning--and just as easy to get from the car to the race start. It was easy to line up at the start line--and attempt to seed ourselves appropriately (though we all know how well that doesn't work between trampling others and getting trampled ourselves). It was easy to stay on course and just as easy to refuel at the finish line before heading home. Running the Turkey Trot was a lot tougher. Not for all of the 3,000-plus participants, but definitely for this participant. I went from feeling good to feeling like my lungs were going to burst out of my chest. I got passed like I was standing still, and by people I swear I could have kept up with had I been running in Chicago. I couldn't run up the hills to save my life. I couldn't sprint even though my legs weren't tired. I finally had a surge of energy--too bad it was like a quarter-mile from the finish line...when we were running downhill. It's not the best idea for me to run a race less than 48 hours after arriving in a city with high elevation. According to about.com, it should have worked, but in my case, I swear I started to feel the altitude after the first half mile, or whenever we stopped running downhill. Or maybe it was my lack of sleep? You can't adjust to the altitude as quickly as you might think. I felt fine...except when it came time to run. Then I was a disaster. Carry water during races. It must be the dry air: I was thirsty the entire race. And I had been drinking plenty of fluids, or so I thought. Colorado kids are FAST. How many little legs did I watch zip by me? A lot. Expect to run slower even though you feel like you're running harder. My finish time was three minutes off my usual 5K time. I should have read these tips before the race, not after. Any high altitude runners out there? What are your tricks for running fast at higher elevations? Photo courtesy of Karel Strandness.